1. Following the spate of violent attacks by officers of the Nigerian Police Force and then by paid hoodlums on our #ResumeOrResign daily sit-outs and peaceful processions in various parts of Abuja, it has become necessary to announce a suspension of our daily activities in the city. 2. This temporary suspension is to enable us restrategize on ways to make our processions less open to such violent attacks and to better ensure the safety of all our members and other participants at our sit-outs and peaceful processions in future. 3. This is also to make known our good intention and unreserved commitment to promote peace and unity in our beloved country. We believe this decision will help in dousing the unnecessary ethnic tension being stoked by the cabal holding Nigeria to a ransom. 4. Whereas our daily sit-out will be suspended temporarily in Abuja, Sit-Out will continue to hold at the Gani Fawehinmi Park, Ojota, Lagos, between 0900hrs – 1000hrs daily; New York (Front of the Nigerian consulate, 828 Second Avenue); and vigil will also be held in front of the Abuja House in London on Friday August 18th, 2017 by 1700hrs. 5. Members of the general public and members of the media are also invited to any of these events to provide support in whatever capacity they may deem fit. 6. 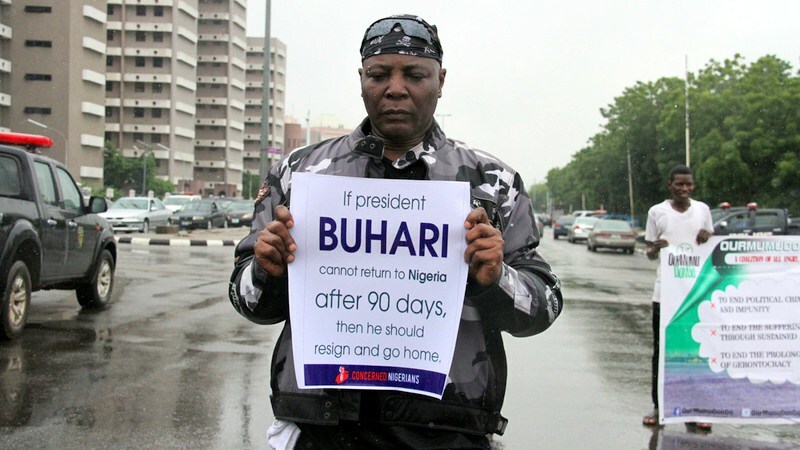 Finally, we hereby demand that President Buhari returns to the country and resume duty as President of the Federal Republic of Nigeria within 21 days from today, or that he resigns completely from office to enable him return to Daura to take care of his ill health. 7. Should the president be unable to comply with any of the aforementioned demands within 21 days, we will approach a court seeking an order of mandamus to compel the Federal Executive Council to set up a committee in line with section 144 of the Constitution of the Federal Republic of Nigeria (as amended), to appraise the health of President Buhari and subsequently determine whether or not he can continue to discharge his presidential functions as enshrined in the constitution. FOR: Our Mumu Don Do Movement.